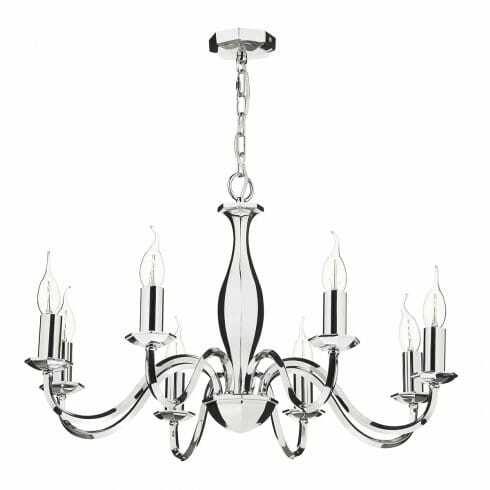 Dar Lighting Athol 8 light ceiling chandelier features a decorative ceiling plate with chain and a curved stem and arms all in polished nickel finish holding 8 candle style lamps. The product code for this Dar chandelier is ATH0838. This solid cast brass chandelier in polished nickel finish is both stylish and elegant and will sit perfectly in any modern or traditional setting within your home and looks perfect with or without shades. Double insulated, height adjustable at point of installation and comes supplied with 150cm of chain and cable. The Athol collection includes a matching 5 light chandelier pendant, 2 light wall fitting and a single light table lamp all of which can be ordered on our website.